From the slight curve of the arms, to the supportive, loose-pillow back this swivel glider proves it has been designed to bring you lasting comfort. Its casual style is able to blend in any home decor style. Additionally, with a multitude of fabric options to choose from, you can be sure this chair is the exact match you've been looking for. 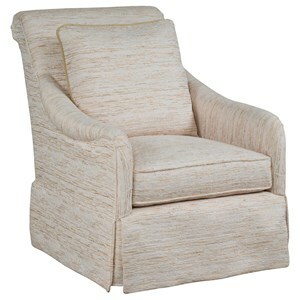 The Joceylyn Casual Upholstered Swivel Glider with Skirt by Kincaid Furniture at Hudson's Furniture in the Tampa, St Petersburg, Orlando, Ormond Beach & Sarasota Florida area. Product availability may vary. Contact us for the most current availability on this product. Padding & Ergonomics Three cushion comfort options are available for special order. If no upgrade is requested, the standard cushion is our Comfort Support Cushion. Browse other items in the Joceylyn collection from Hudson's Furniture in the Tampa, St Petersburg, Orlando, Ormond Beach & Sarasota Florida area.